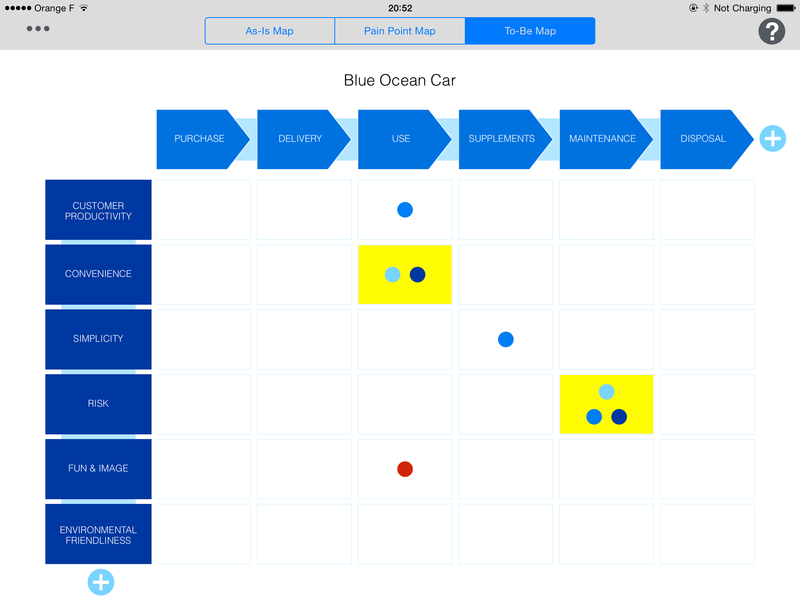 In line with the new ways people access information these days, a suite of simple and easy to use mobile apps have been developed for Blue Ocean Strategy and Blue Ocean Leadership, created by W. Chan Kim and Renée Mauborgne. These are powerful companion tools that help managers gain keen insight into how to create new market space and unleash untapped talent in their organizations. They come with built-in tutorials and simple drop and drag functionality. 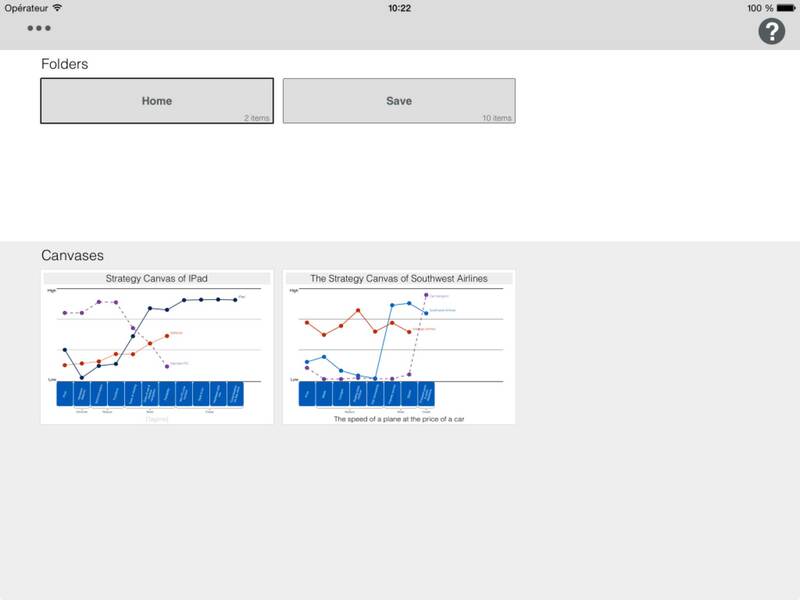 They allow users to collaborate in analyzing, formulating and communicating their strategy and leadership profiles and are available for free in the Apple AppStore and Google Play store. 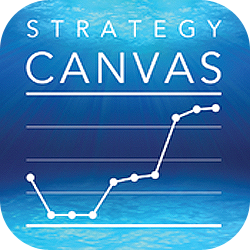 The Strategy Canvas is an analytic tool, developed by W. Chan Kim and Renée Mauborgne, that is central to Blue Ocean Strategy. Here we introduce the Strategy Canvas app that lets you focus on the big picture in strategy formulation. 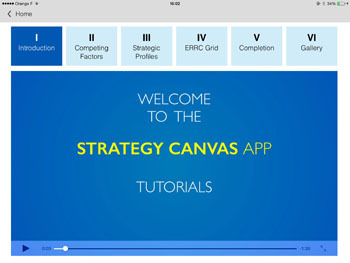 An easy, efficient, and highly effective platform for strategy creation, the new Strategy Canvas app enables users to dynamically create strategy canvases and share and collaborate on them using intuitive touch controls and a clean Interface. 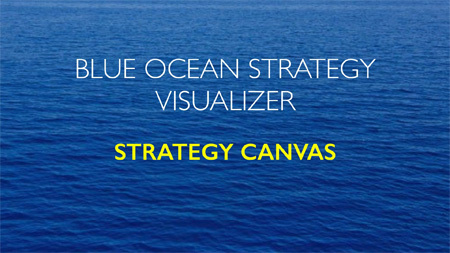 It is an excellent companion tool for analyzing, formulating and communicating your strategy, whether you are an expert strategist or just getting started in Blue Ocean Strategy. 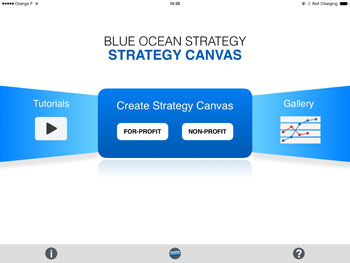 Created by the INSEAD Blue Ocean Strategy Institute, the Blue Ocean Strategy App is available free from the iTunes App Store and Google Play. 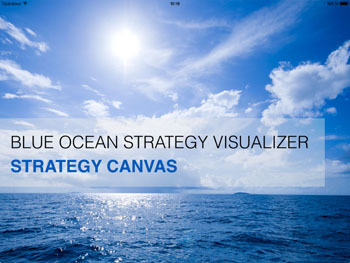 Create your strategy canvas to analyze your strategic landscape. Managers often crunch numbers instead of developing a clear strategic picture first. 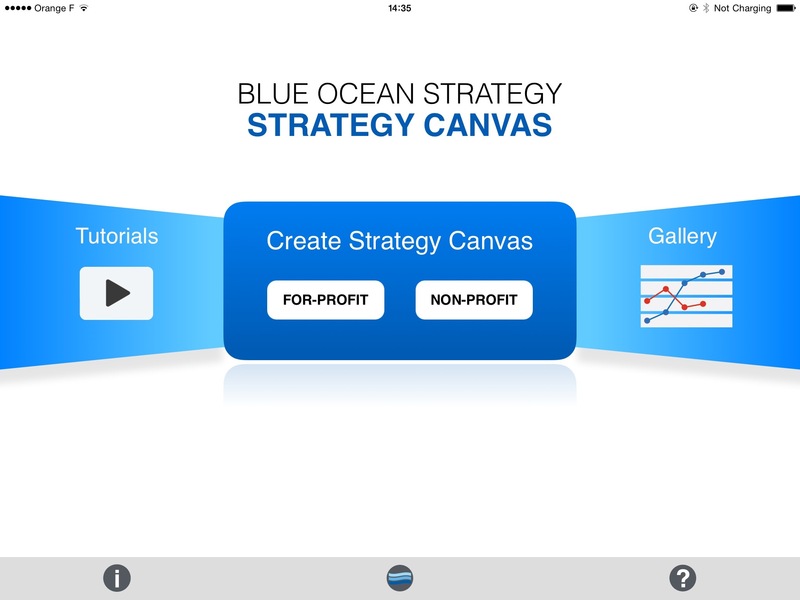 Based on the Blue Ocean Strategy approach developed by Kim and Mauborgne, the Strategy Canvas app lets you draw and focus on the big picture first. Start by listing your industry’s key competing factors along the horizontal axis and plotting your and your competitors’ offering levels across the vertical axis to gain keen insight into the strategic profiles or value curves of your industry. Discover how the approach consistently opens your eyes to strategic realities and unlocks your creativity to break away from the competition. Visualize the Eliminate – Reduce – Raise – Create Grid. The Strategy Canvas is complemented by the Eliminate-Reduce-Raise-Create (ERRC) Grid that helps you formulate your To-Be strategy. This framework, created by Kim and Mauborgne, drives you to consider each of the four actions – eliminate, reduce, raise and create – that are essential to unlocking a new blue ocean that achieves both differentiation and low cost. It immediately flags strategies that are focused on only one or the other. Share and Save Strategy Canvases. The Strategy Canvas app’s sharing features facilitate teamwork, whether your team is in the same room or dispersed across the world. 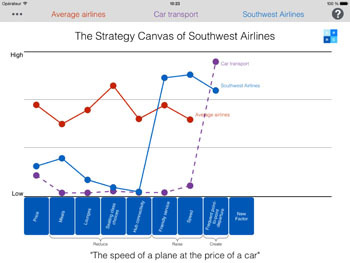 Team members can easily share the strategy canvases by email or on various social media platforms. 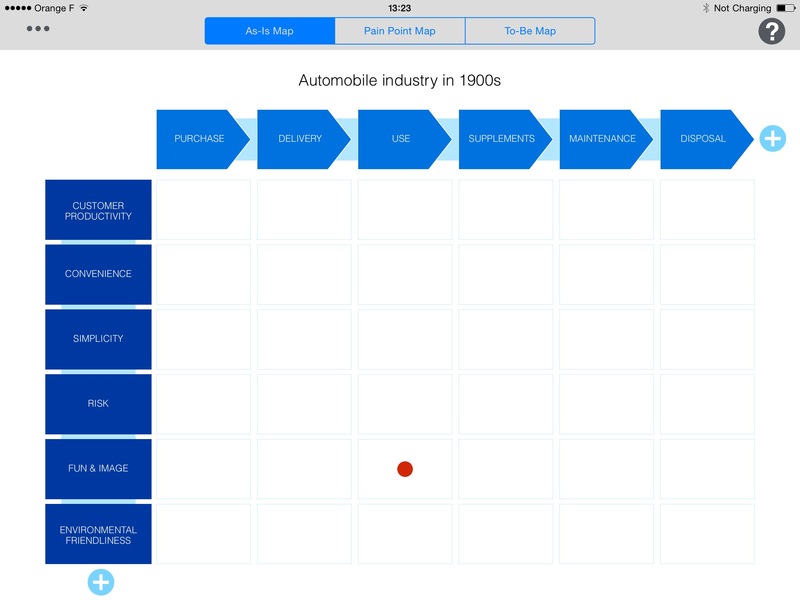 Edit your strategy canvas using intuitive touch controls. 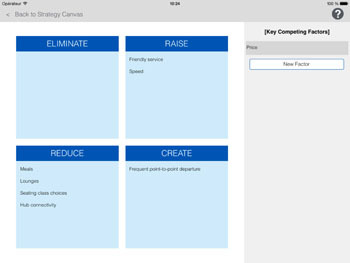 The Strategy Canvas app allows you to simply drag and drop factors and offering levels to edit the Strategy Canvas. 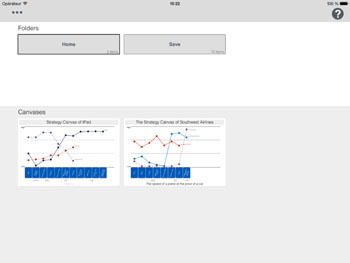 As you reorder the competing factors, the app instantly reconfigures the value curves or strategic profiles for all offerings. 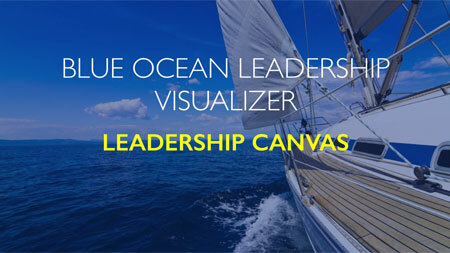 The Leadership Canvas is a central, analytic tool of Blue Ocean Leadership, developed by W. Chan Kim and Renée Mauborgne. 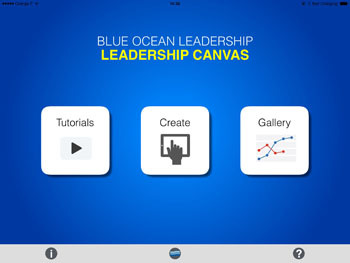 Here we introduce you to the Blue Ocean Leadership app, an easy, efficient, and highly effective platform that enables you to evaluate your current leadership reality and create a new, effective leadership profile by collaborating with teammates. 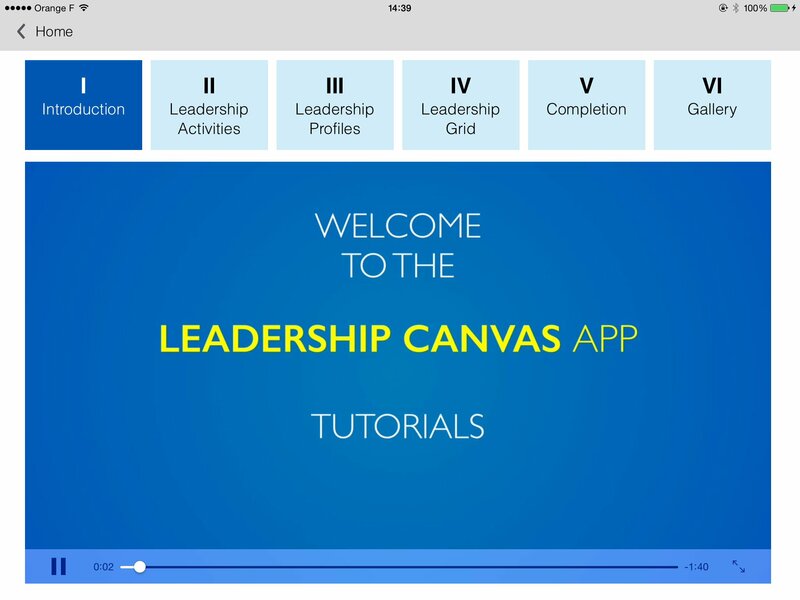 Providing intuitive touch controls and a clean interface, the Leadership Canvas is an excellent analytic app for developing and managing your leadership profiles so that you can unlock the ocean of unrealized talent and energy in your organization. What are you waiting for? Created by the INSEAD Blue Ocean Strategy Institute, the Blue Ocean Leadership App is available free from the iTunes App Store and Google Play. See your leadership reality. 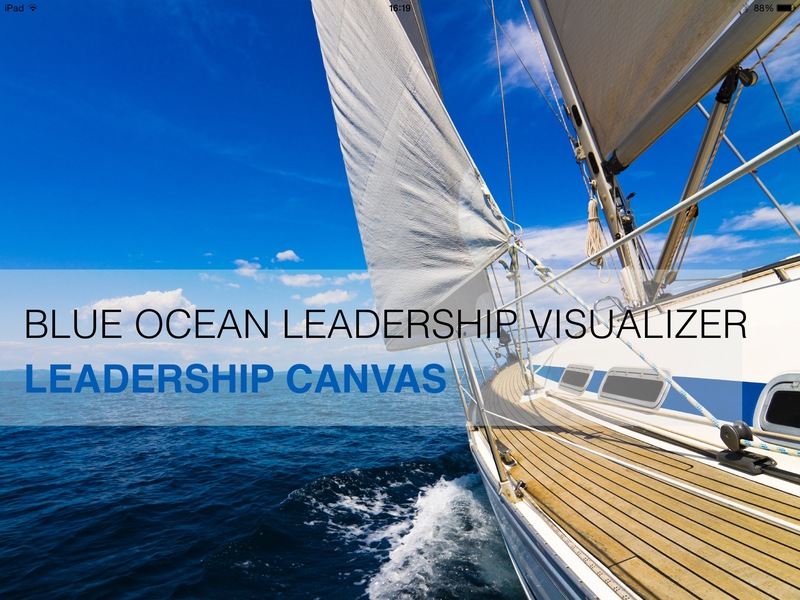 The same way that blue ocean strategy can create an ocean of new demand, blue ocean leadership can release employees’ ocean of untapped talent and energy in organizations. 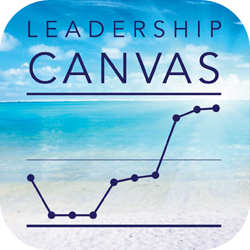 The Leadership Canvas, developed by Kim and Mauborgne, is an essential tool that drives you to draw a clear picture of your current leadership reality to understand the way employees experience leadership and where leadership may be falling short. 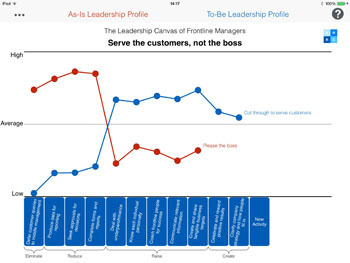 Start by listing key leadership acts and activities along the horizontal axis and plotting leaders’ investment of time and effort in each activity across the vertical axis. The big picture will give you keen insight into your current leadership reality and unlock your creativity to develop a new, effective leadership profile for the future. 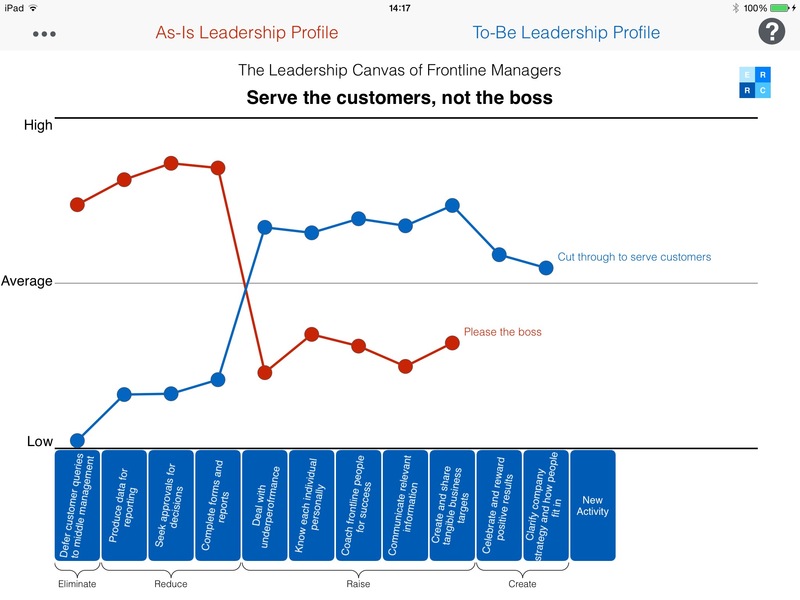 Visualize what leaders should do to achieve high impact at low cost. The Leadership Canvas is complemented by the Leadership Grid that helps you to formulate your To-Be leadership profile that will create a step change in leadership strength. This is an action framework that drives you to find out what leadership activities should be eliminated reduced, raised, and created, pushing you to achieve high impact at low cost, or a lower investment of time. Share and Collaborate with Leadership Canvases. Like the Strategy Canvas app, the Leadership Canvas app provides sharing features that facilitate efficient teamwork, whether your team is in the same room or dispersed across the world. Team members can easily share the leadership canvases by email or on various social media platforms, exchanging ideas through notes on each leadership canvas. 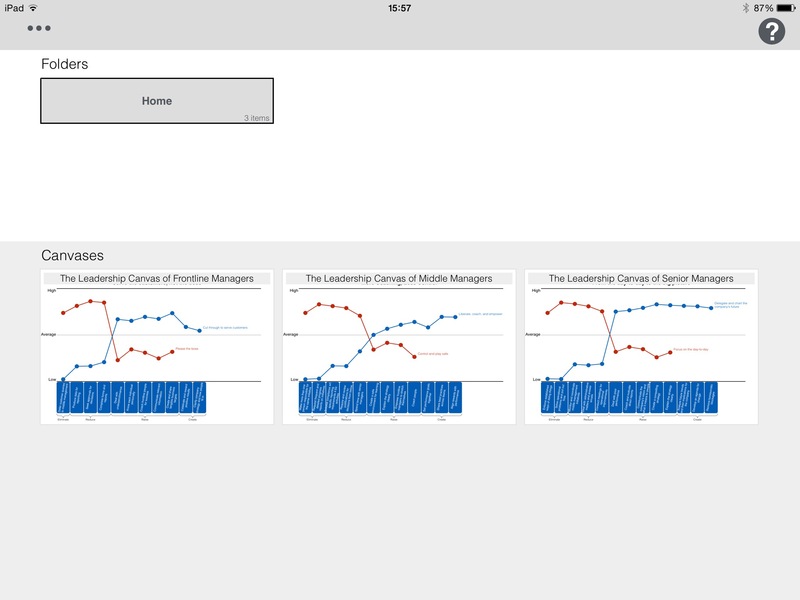 Draw your leadership canvas using intuitive touch controls. The Leadership Canvas app allows you to draw the Leadership Canvas easily and effectively by simply dragging and dropping leadership activities and their investment levels with your finger. 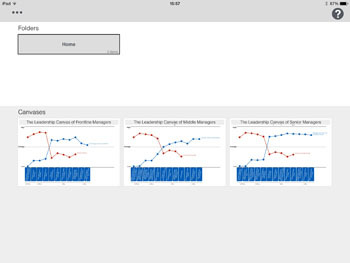 Editing becomes so easy – when you reorder the leadership activities, the Visualizer instantly reconfigures the leadership profile. The Buyer Utility Map, developed by W. Chan Kim and Renée Mauborgne, is an analytic tool of Blue Ocean Strategy. It is designed to uncover hidden opportunities to create blue oceans of new market space and to test if your offering creates exceptional buyer utility. Here we introduce the Buyer Utility Map app, created by the INSEAD Blue Ocean Strategy Institute, for iPad. It is available free from the iTunes App Store. Outline your buyer experience cycle. Most industries hold a narrow view of the buyer experience, intently focused on creating utility at a single stage of the buyer’s experience. 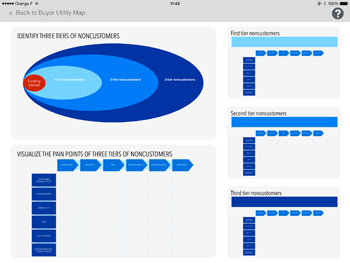 The buyer utility map allows you to comprehensively analyze the breadth of the buyer experience using what W. Chan Kim and Renée Mauborgne call the ‘buyer experience cycle.’ The buyer experience cycle is typically composed of six distinct stages, running sequentially from purchase to disposal. 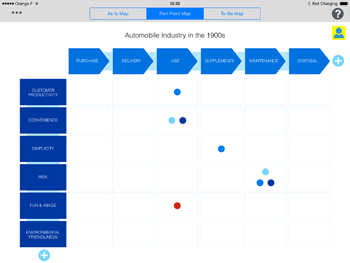 In analyzing your buyers’ experience cycle, you can use the basic cycle set in the Buyer Utility Map app or modify this to better reflect your setting. Identify blocks to buyer utility and uncover opportunities for future growth. The tool outlines six utility levers you can pull to deliver utility to your buyers at the various stages of the buyer experience cycle. The map allows you to identify the full range of utility spaces that a product or service can potentially fill. Here users are prompted to identify the noncustomers of the existing industry and their pain points in order to understand the blocks to utility for buyers. This noncustomer exercise helps you to uncover opportunities that will simultaneously raise buyer utility while reducing your cost structure, which is central to Blue Ocean Strategy. Test if your offering unlocks hidden utility for your buyers. 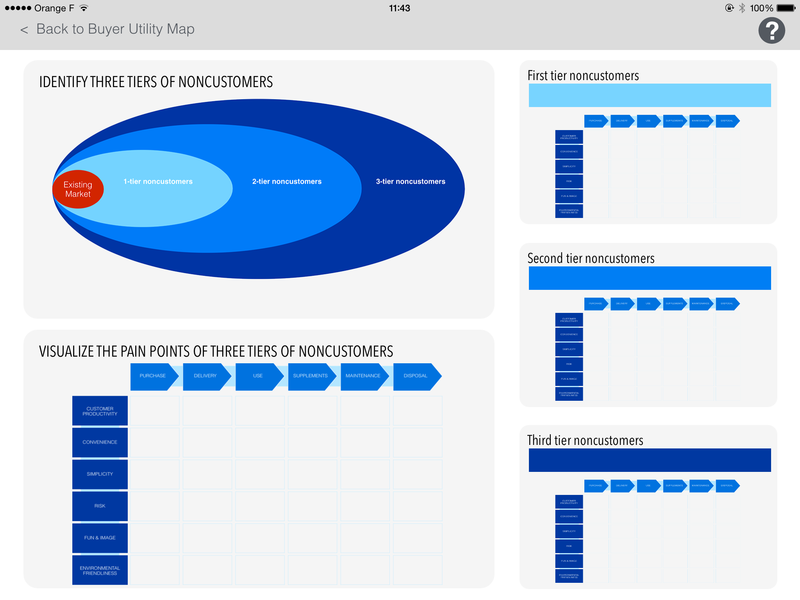 The Buyer Utility Map app enables you to assess if your offering delivers exceptional utility vis-à-vis what the existing industry is currently offering. 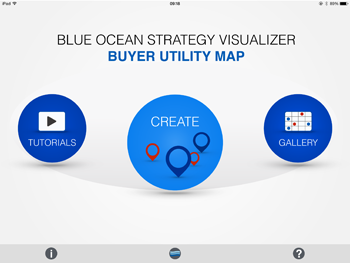 You can check the blue ocean potential of your business using the to-be buyer utility map. Collaborate to unlock hidden utility for your buyers. 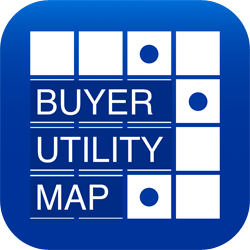 The Buyer Utility Map app allows you to instantly share your buyer utility map with your team by email or on various social media platforms. 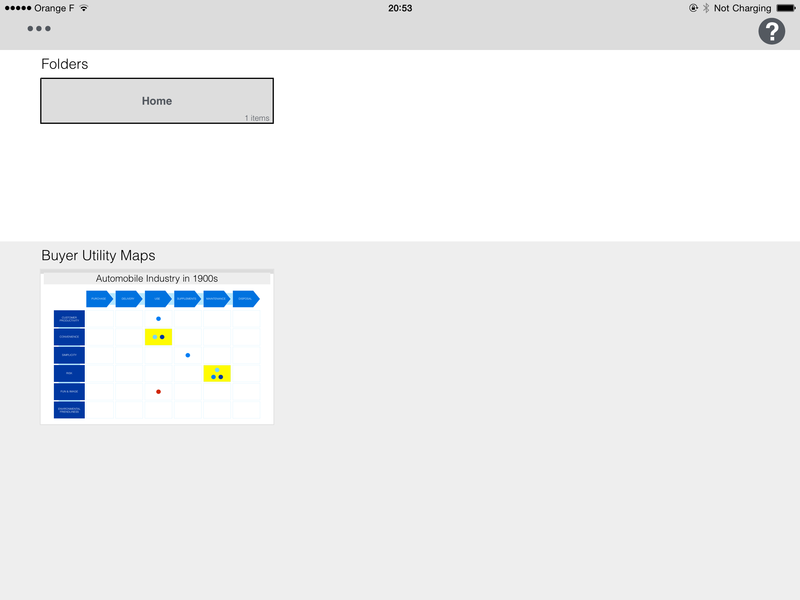 The simple and intuitive interface enables you to edit the map easily and make notes on it.